"The calls of young people revolve around anarchy, despair, cries, extremism, anger, integrity, authenticity and instinct" (translation). Anonymous, excerpt from the Manifeste –AGI, December 8, 1968, quoted in Jean-Philippe Warren, Une douce anarchie : les années 68 au Québec, Montréal, Boréal, 2008, p. 106. The year 1968 was a year of protests. The Beatles sang Revolution and the Rolling Stones Street Fighting Man. Huge student demonstrations took place in Paris, Mexico, Tokyo and other major cities around the world. Many among them were suppressed violently. In the United States, protests against the war in Vietnam were rampant. Riots broke out in Chicago after the death of Martin Luther King. In Czechoslovakia, the Spring of Prague and the advent of socialism with a human face ended abruptly with the appearance of Soviet tanks in the capital. In Quebec, students brandished the flag of rebellion. The premises of this storm went back to the onset of the decade, when student associations expressed the wish to be consulted by school network management and demanded a freeze on tuition. For this initiative, old associations such as university associations in Montréal and Laval dating back to the first third of the 20th century joined more recent associations such as the Fédération des associations générales des collèges classiques du Québec (FAGECCQ) and the Union générale des étudiants (UGEQ), created in 1962 and 1964, respectively. 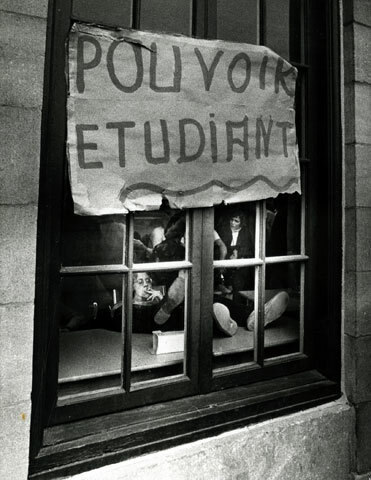 A few years later (in 1966) they joined forces to demand free education. 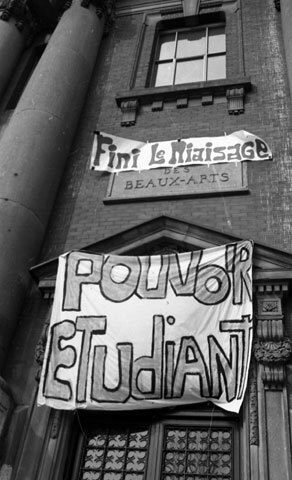 In 1968, the student movement in Quebec culminated in a massive strike at the CEGEPs (general education and trade colleges). In the early months of 1968, the revolt gained increasing momentum. The anger exploded in October. The general strike at the Lionel-Groulx de Sainte-Thérèse-de-Blainville CEGEP was the spark that set things off. Nearly two-thirds of all colleges (15 out of 23), high schools and a few hundred university students joined the movement. However, the great October revolt was only a flash in the pan, since a few weeks later everything returned to normal. A number of factors were at the origin of the uprising. In the CEGEPs, the students denounced the lack of equipment, inadequate laboratory facilities and the shortcomings in services offered. They were also dogged by other fears such as the inability to attend a school of higher learning and the difficulty of entering the seemingly closed job market. Finally, the list of their grievances regarding the school system and the education offered to them was interminable. And if this were not enough, they reviled government and the political and economic system. In short, in the students' opinion the world needed to revamped from top to bottom.